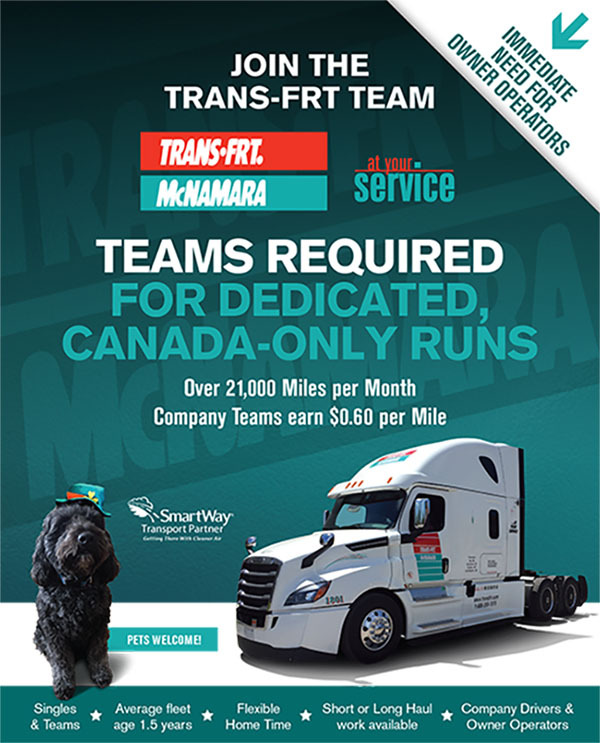 Trans-Frt McNamara Inc. | Trans-Frt. McNamara Inc.
We pool our resources and expertise to provide customized logistics solutions tailored to your current and future requirements. Our aim is to add value to your supply chain, while reducing your overall transportation costs. Our commitment to going even further shines through in the way we plan, manage and execute each and every delivery. Trans-Frt McNamara is built on three guiding principles – quality, reliability and exceptional service. And it’s a philosophy shared by every member of our team – from our professional bonded drivers to our customer advisors. Let us know what we can do for you. Our modern fleet of more than 100 tractors and 220 trailers can provide service anywhere in North America.